Guest contributor Dara Weinberg gives us a behind-the-scenes, in-depth analysis of Studium Teatralne’s The King of Hearts Is Off Again, coming to the Odyssey Theatre from Poland this week. Between Oct. 5 and 14, Angelenos interested in the most impressive manifestations of the human body in action should clear their calendars of weightlifting competitions and roller-derby matches and head to the Odyssey Theatre for Studium Teatralne’s Król kier znów na wylocie [The King of Hearts Is Off Again], a visiting spektakl from Warsaw featuring a vigorous physical style of performance. The King of Hearts… is a metaphoric reenactment of the traumas endured within Poland during WWII. It is adapted from a novel by Hanna Krall, about a Jewish woman in Poland who hides her identity and passes as a German in order to survive the occupation and rescue her husband from a concentration camp. (Krall, who was born in 1937, survived the war in hiding with Polish families; her own family died in Majdanek.) Studium Teatralne’s adaptation combines a time of historic agonies with a performance style that excels in — revels in — displaying physical agony. Marianna Rampulla, who plays the tortured lead character Izolda, is in a perpetual state of nearly falling over. Her spine is almost never in alignment with her legs or with the y-axis. The stage picture of The King of Hearts… is a Mannerist painting come alive, with twisted fingers clutching at twisted limbs. This style of acting comes from a very particular historic context: it derives from the dead-but-not-forgotten 20th-century Polish theater director Jerzy Grotowski and his work with the element of precision in actors’ bodies. Grotowski, born in 1933, spent his childhood in Nazi-occupied Poland and his adulthood in the USSR-controlled PRL (People’s Republic of Poland). His work as a director often seemed to manifest the torments of his occupied country through the bodies of his actors. Studium’s director Piotr Borowski is one of the group of contemporary Polish theater artists who worked directly with Grotowski for a significant period of time. The intense style of performance visible in The King of Hearts… is connected directly to Grotowski’s approach to theater. To understand more about where Studium Teatralne comes from, a drive-by overview of the three phases of Grotowski’s work is useful. This division into three parts is very convenient for academics — during Grotowski’s lifetime, it was also convenient for his own self-promotion to sometimes re-invent himself publicly. In my sketch of this framework, I’m heavily indebted to a series of lectures I heard at the annual Summer Seminars presented by Wrocław’s Grotowski Institute this September, delivered by Jagiellonian University’s Professor Dariusz Kosiński. Grotowski’s output begins with the “theater of productions,” when he made plays, or things mostly resembling plays, intended for theater audiences, marked by tremendous physical precision on the part of his actors. Stage two is called “paratheatre”— happenings, “beehives,” people running through the woods, events involving hundreds of people. If this sounds like the 1970s, it was. According to Kosiński, the problem with paratheatre was that, with so many participants, it devolved into a sort of “emotional soup.” Grotowski wanted to focus, and one of the things he began to focus on, increasingly, was traditional and ritual song from ancient cultures. The third stage, called (among other things) “Art as vehicle,” took place mostly outside of Poland due to the early-1980s declaration of martial law, and was increasingly limited to the small circle of the people taking part. Very little was produced for an outside audience after years of practicing “actions.” This was work for the benefit of participants (called “doers,” not “actors”) themselves. The actions made extensive use of traditional songs and dances, had a ritualized sense of secrecy, and, according to those who witnessed them, also had potent ritual-like effects. Borowski worked one-on-one with Grotowski in this, the last phase, over a period of seven years in Pontederra, Italy. His training in these “Art as vehicle” methods is part of where The King Of Hearts… gets its intense quality. Even though Studium’s actors are presenting work to larger audiences, we can hazard that they are also in some part enacting a series of “actions” that have a strong effect on themselves, the “doers.” The performers seem to be going through something beyond what we’re used to witnessing on a normal evening at the theater. The King of Hearts…is a theatrical production, not a ritual, and it is much more about vigorous movement than traditional song. The design elements of the piece are contemporary — a few WWII-era costumes and props, music based on John Zorn’s motifs. Nonetheless, the Grotowskian interest in the rituals, traditions, and art of ancient cultures is still present, although submerged, in Borowski’s work. He has spent time collecting folk songs in rural eastern Poland, and the company has made an hour-long documentary, Koniec Pieśni [The Song Is Over], about the disappearance of this tradition, which will be screened in L.A. at Automata Arts on Oct. 12, during the run of The King of Hearts…. In addition, in Warsaw, Studium runs a once-monthly lecture series called “Historia jednego obrazu” (Story of a work of art); one I saw last winter was about a piece from Haiti. The King of Hearts… can be read, in part, as a variation on the theme of this series. The work of art being contemplated is a reproduction of a painted wooden synagogue ceiling from the pre-WWII era. There is no accompanying lecture, but the performance occuring on top of the reproduced ceiling is, itself, a commentary. I will attempt to describe the ceiling reproduction here, because it will not be present in the Los Angeles production. 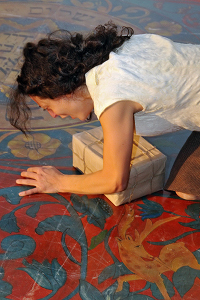 In their work and performance space, on the Praga side of the Vistula River in Warsaw, Studium Teatralne has faithfully reproduced the detailed colored stencilings of a regional pre-war wooden synagogue ceiling, complete with curlicues and plant motifs, on their wooden floor — the same floor on which they work and perform. These wooden floors, similar to those in yoga studios, are a marker of most of the post-Grotowski theaters; they need the floors for their physical training. This painted reproduction of the synagogue ceiling was created specifically for The King Of Hearts…. When I brought a group of expat Jewish academics in Warsaw to see The King Of Hearts… last January, and we introduced ourselves to Borowski, he told us that sometimes people who come into their space mistakenly think that the paintings are “real” — that is, that they are a genuine pre-war artifact of a synagogue. However, it was apparent to the visitors that these paintings could not possibly be “real,” because the Hebrew letters for the name of God had been written on the floor, where the feet of dancers and the shoes of the audience moved over them. This goes against a Jewish custom that holds the Hebrew name of God in great reverence; it’s forbidden, for example, to erase or destroy the written letters, and the word is never said aloud. This is a prohibition which is much more intensely felt and observed in Hebrew, although some Jews also observe it even in English, which is why spellings such as “G-d” are sometimes used. My guests, the academics, documented the stenciled Hebrew with their iPhones. After the performance we discussed the situation. One suggested that, if the theater wanted to adjust their action, an extra tag or curlicue could be added to one of the letters, so that it was no longer an exact written representation of the name of God. But it seemed ungenerous to bring this up, given the amount of effort that had gone into their careful reconstruction of the synagogue ceiling, and the fact that so many of these synagogues, in Poland and elsewhere in Central Europe, had been destroyed by the Nazis. As with Grotowski’s famous production of Akropolis, set in a concentration camp, the point of The King of Hearts… is not — or not only — the literal authenticity of the representation of the historic Jewish experience. The point is that the performance is of Polish origin and authorship (based on a novel by a Polish Jewish woman, and directed by a Polish director) and that it openly discusses the subject of Polish Jews, including those lost in the war. Borowski, unlike Grotowski, is under no risk of Soviet suppression for discussing these topics, but that does not mean that his efforts to present this history are not still necessary and relevant in contemporary Poland. Until the Museum of the History of the Polish Jews, complete with its own detailed reconstruction of a painted synagogue roof (to be displayed in roof format), opens at the end of 2013, Studium Teatralne’s Praga floor is one of the most vivid representations of the wooden synagogues in Warsaw. The King of Hearts… can also be read, in part, as a Grotowskian “action” with a quasi-ritual effect. The “action” is a stylized re-enactment of the German occupation of Poland. By repeating this theatrical action with great precision, including walking over a sacred symbol of the ravaged Polish Jewish population, Studium Teatralne attempts to exorcise some of the trauma of that occupation. Audience members watching The King of Hearts… in Los Angeles may find that it adds another layer of intensity to an already intense performance if they imagine a painted synagogue floor under the actors’ feet. When the Polish actors playing Nazi soldiers are stepping on the Hebrew, both the performers and the witnessing audience are implicated as “doers” in the quasi-ritual. The King of Hearts Is Off Again (Król kier znów na wylocie) (with English subtitles) runs Oct. 5-14 at the Odyssey Theatre, 2055 S. Sepulveda Blvd., LA 90025. Show times are Friday, Oct. 5, at 8 p.m.; Sunday, Oct. 7, at 7 p.m.; Tuesday, Oct. 9, at 8 p.m.; Thursday, Oct. 11, at 8 p.m.; and Sunday, Oct. 14, at 7 p.m. Tickets are $30 ($20 for students with ID); call (310) 477-2055, ext. 2, or visit www.OdysseyTheatre.com. Koniec Pieśni (The Song Is Over), an hour-long documentary by Studium Teatralne about the disappearance of folk music in eastern Poland, will screen on Friday, Oct. 12, at 8 p.m. at Automata Arts, 504 Chung King Court, LA 90012. Visit www.automata-la.org or http://www.facebook.com/events/364507220296724/. For tickets, visit http://www.brownpapertickets.com/event/282106. Studium Teatralne’s trip to the United States was financed by the Ministry of Culture and National Heritage of the Republic of Poland, and their presentations of Król kier… at the Odyssey Theatre were supported by the Polish Consulate in Los Angeles.